For more than five hundred years, Native communities across the Americas have demonstrated resilience and resistance in the face of violent efforts to separate them from their land, culture, and each other. 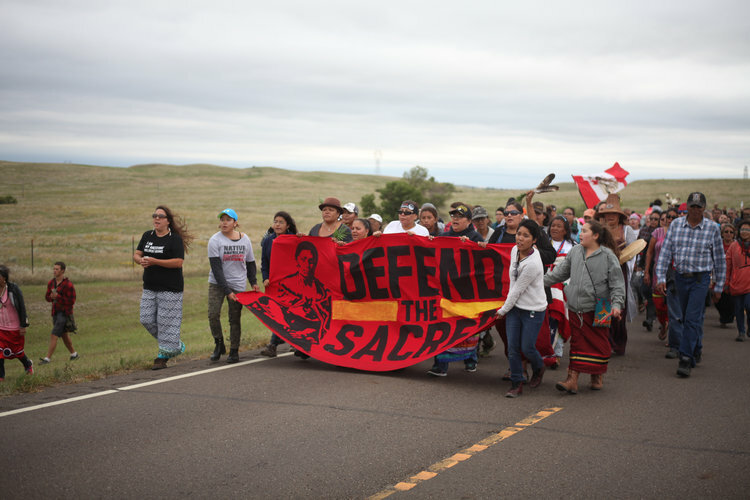 They remain at the forefront of movements to protect Mother Earth and the life it sustains. Today, corporate greed and federal policy push agendas to extract wealth from the earth, degrading sacred land in blatant disregard of treaty rights. Acknowledgment is a critical public intervention, a necessary step toward honoring Native communities and enacting the much larger project of decolonization and reconciliation. Join us in adopting, calling for, and spreading this practice. Download the Guide: Created in partnership with Native allies and organizations, the Guide offers context about the practice of acknowledgment, gives step-by-step instructions for how to begin wherever you are, and provides tips for moving beyond acknowledgment into action. WHY INTRODUCE THE PRACTICE OF LAND ACKNOWLEDGMENT? Counter the “doctrine of discovery” with the true story of the people who were already here. Create a broader public awareness of the history that has led to this moment. Begin to repair relationships with Native communities and with the land. Support larger truth-telling and reconciliation efforts. Remind people that colonization an ongoing process, with Native lands still occupied due to deceptive and broken treaties. Take a cue from Indigenous protocol, opening up space with reverence and respect. Inspire ongoing action and relationship. Acknowledgment by itself is a small gesture. It becomes meaningful when coupled with authentic relationship and informed action. But this beginning can be an opening to greater public consciousness of Native sovereignty and cultural rights, a step toward equitable relationship and reconciliation. Imagine going to a local coffee shop, music venue, grocery store, or town hall, and finding a sign on the wall acknowledging traditional lands. Sound far-fetched? It doesn’t have to be! As part of this campaign to #HonorNativeLand, we partnered with Native artists to create downloadable signs that you can print, customize, and post in your community. Download high-resolution copies of these images as well as sample social media posts from our public folder. We urge organizations, collectives, institutions, and agencies to publicly commit to practicing traditional Native land acknowledgment. To stand and be counted and to inspire others with your commitment, take the pledge. As a step toward honoring the truth and achieving healing and reconciliation, our organization commits to open all public events and gatherings with a statement acknowledging the traditional Native lands on which we stand. Such statements become truly meaningful when coupled with authentic relationships and sustained commitment. We therefore commit to move beyond words into programs and actions that fully embody a commitment to Indigenous rights and cultural equity. We are grateful to all of the partners whose work inspired this campaign. Special thanks to the following individuals who offered insight and support in its creation: T. Lulani Arquette (Native Hawaiian), Daniel Banks, Sherry Salway Black (Oglala Lakota), Mary Bordeaux (Sicangu Lakota), Ron Martinez Looking Elk (Isleta Pueblo), Laree Pourier (Oglala Lakota), Lori Pourier (Oglala Lakota), Shirley Sneve (Rosebud Sioux), Rulan Tangen (mixed Indigenous heritage), Josh Reid (Snohomish), Tanaya Winder (Duckwater Shoshone/Pyramid Lake Paiute/Southern Ute), Warren "Guss" Yellowhair (Northern Cheyenne/Oglala Lakota), and Larissa FastHorse (Sicangu Nation Lakota) and Ty Defoe (Ojibwe/Oneida) of Indigenous Direction. Thank you to Nicholas Ward, Connie Fitzpatrick, and the Native Arts and Cultures Foundation for use of their photographs, and Keith BraveHeart (Oceti Sakowin: Oglala Lakota), Bunky Echo-Hawk (Pawnee/Yakama), jetsonorama, Marlena Myles (Spirit Lake Dakota), Bryan D. Parker (Muscogee Creek/ Choctaw/White Mountain Apache), Remy (Diné), and William Wilson (Diné) for the use of their artwork. Any omissions or errors are the responsibility of the USDAC.